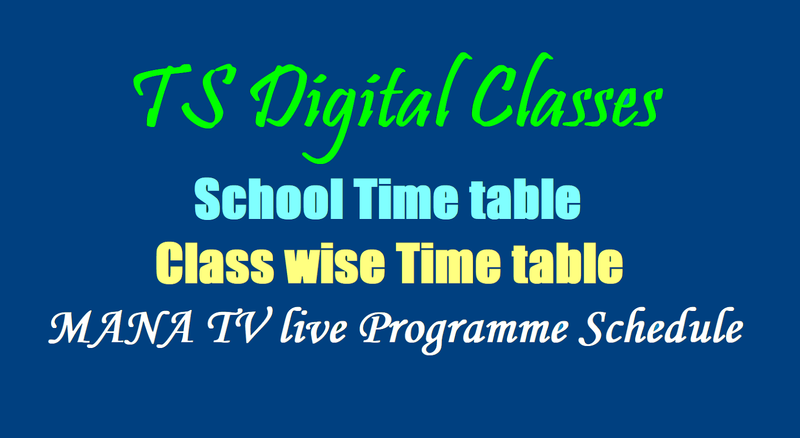 T SAT Mana TV Digital Lessons/Digital Classes Transmission Schedule, Guidelines 2017: Mana TV Digital Lessons/Digital Classes Transmission Schedule, Guidelines have been issued by C and DSE Telangana. These Digital lessons to broadcasted through MANA TV Live programmes or MANA TV Youtube Channel. Digital Lessons School time table, Digital Lessons Class wise time table and Period wise lessons names have been sent to all DEOs. MANA TV lessons/digital classes are available Online mode and Offline mode. All HMs should keep one notebook recording the lessons viewed period wise, day wise and subject wise with signature of teacher and recording the number of students attended countersigned by the HM. The supervisory officers shall observe the record book and offer remarks on the extent of utilization of digital classes i.e., both online and offline. Further utilization of offline mode of digital lessons may also be recorded in the book. All the RJDSEs and DEOs in the State are hereby informed that vide reference 1st cited, detailed schedule for transmitting digital lessons through MANA TV have been communicate with Model/ suggested Time tables i.e., school time table and class wise time tables incorporating regular periods for viewing digital classes transmitted by MANA TV@ 5 lessons per day from classes VI to X.
Vide reference 2 cited, a detailed schedule of digital lessons transmission for the month of June is enclosed with period wise names of lessons in different subject areas for information and necessary action. The District Educational Officers are directed to communicate the same to all the Head Masters of schools of all managements i.e., Government, Local Bodies, Model Schools, KGBVs and all types of Residential schools, Government Aided schools etc. along with Mandal Educational Officers to utilize the transmitted lessons. In this regard, all the District Educational Officers are informed that some of the Head Masters / Principals have not been utilized digital transmissions from MANA TV during last academic year and not taken efforts in installing ROT or taking cable connection to utilize MANA TV programmes. Therefore, all the District Educational Officers are directed to take necessary steps for viewing of MANA TV lessons in all the High Schools by installing ROTs I cable connections and attend repairs I replacement of parts if any. All the schools should possess MANA TV programmes viewing facilities before 30th June 2017 without fail. The existing school grant amounts in High Schools may be used to install the ROT / cable connection. The SSA Sectoral Officer / Nodal Officers may be kept incharge to look after the area of digital classrooms, ICT trainings in the DEO office for monitoring the digital class / ICT programmes, trainings etc. The name of the officer shall be intimated to the Director, RMSA, Director, SIET. All the Head Masters shall be directed to keep one notebook recording the lessons viewed period wise, day wise and subject wise with signature of teacher and recording the number of students attended countersigned by the Head Master. The supervisory officers shall observe the record book and offer remarks on the extent of utilization of digital classes i.e., both online and offline. Further utilization of offline mode of digital lessons may also be recorded in the book. Every transmission of the lesson during a period is for 20 to 25 minutes and the remaining time in the period i.e., 15 to 20 minutes may be used for classroom interaction based on the questions I exercises posed at the end of the transmission. The concerned teacher has to write the questions I exercises on the blackboard and to conduct discussion and clarify the doubts on the concepts transmitted. The teacher must be active during the transmission and observe the methodology of subject transmission and adopt potential processes and conduct post transmission activities as informed at the end of digital transmission. The teacher must be prompt in attending the digital classes at the beginning of the period so that he can give some introduction to the topic to students and arrange for viewing of transmitted lesson and conduct post transmission activities. All the District Educational Officers are requested to communicate the guidelines as above to all the Head Masters / Principals of all types of schools in the district i.e., Government, Local Bodies, Model Schools, KGBVs and all types of residential schools, Government aided schools etc. and Mandal Educational Officers in the district and see that all children get benefited by the digital lessons. Teacher opinions on quality of digital lessons and further suggestions to improve the lessons from the teachers / Head Masters may be obtained through the Nodal Officer / SSA Sectoral Officers and furnish the same to the Director, SIET and a copy to Commissioner ez Director of School Education. State level Monitoring teams will be drafted on quarterly basis to observe the quality of curriculum transaction and also utilization of digital lessons, availability of ROTs I cable connections, functional aspects of computer labs etc. The District Educational Officers are directed to furnish a report to the Commissioner & Director of School Education on or before 30th June 2017 saying that all the High Schools possess ROTs I cable connection to view MANA TV lessons and also having LCD projectors /K-YANs to view digital lessons through offline.